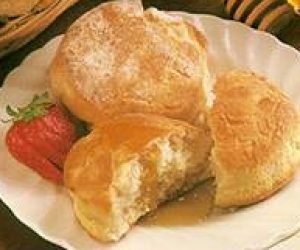 TThis is a biscuit recipe courtesy of Straus Family Creamery. 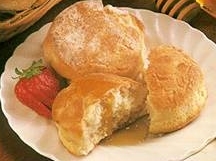 They are delicious and flaky- just be sure to use Straus ingerdients in the mix! Prepare a baking sheet by rubbing 1 tablespoon butter and dust with 1 teaspoon flour. or using parchment paper. Sift the flour, salt, baking powder and sugar together. Cut in the butter with a fork or a pastry cutter until butter is in small crumbles. Add most of the milk, keeping just a couple of tablespoons back. Turn the dough onto a floured board and gently knead until the ingredients are evenly mixed. Gently roll the dough out until it is 1/2 inch thick. Cut into desired size and place on the baking sheet. Brush with milk and bake in oven for 8-10 minutes or until golden.